Follow Oki Setiana Dewi through her Official App smarturl.it/okisetianadewi .Download the free Oki Setiana Dewi official app now! Stay connected to Oki Setiana Dewi on her official app. 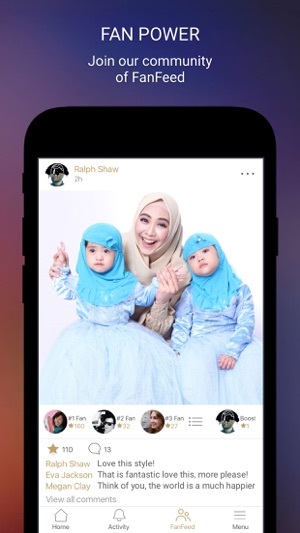 - Boost your comments with Superstars, become a Top 3 Fan, and be seen by Oki Setiana Dewi. - Follow Oki Setiana Dewi social media. Download the Oki Setiana Dewi official app now and #BeSeen! Oki Setiana Dewi is an admirable and multitalented woman who is widely known by many people.This pretty woman is an actress, known for Ketika cinta bertasbih (2009) and Ketika cinta bertasbih 2 (2009).She is also an artist, author, and speaker . She was born on 13th January 1989 in Batam. Oki Setiana Dewi finishes from University of Indonesia, Faculty of Cultural Knowledge (FIB), and had the title of S.Hum in 2012. During the college, she has a lot of achievement that had been accomplished. Her achievement are, the best freshman OKK UI 2007, the best freshmen PSA MABIM FIB UI 2007, and in the arts. She is an icon and a role model for many teenagers. She inspires many teenagers in this country because her multitalented.